Pineapple Upside Down Cake is one of my beloved childhood desserts. Mom could whip one up very simply. Usually a two-egg yellow cake, but with pineapple juice in place of the milk in the recipe. A bed of brown sugar with rings of pineapple nestled in along with a neon red cherry in the center of each one. It was easy to portion and serve–everyone got a square with a circle of pineapple in it. And then there’s cheesecake. I have rarely met one I don’t love. Sweet, savory, somewhere in between. Cream cheese, ricotta cheese, sour cream, goat cheese, you name it, I’m in. So combining pineapple upside down cake with cheesecake seemed like an excellent plan. I’m sure others have done it–I have sort of given up looking this stuff up since almost nothing is completely original–but this is how I did it. Rather than using a traditional graham cracker crust, I opted to go gluten free with a coconut macaroon crust, perfect since pineapple and coconut go so well together. 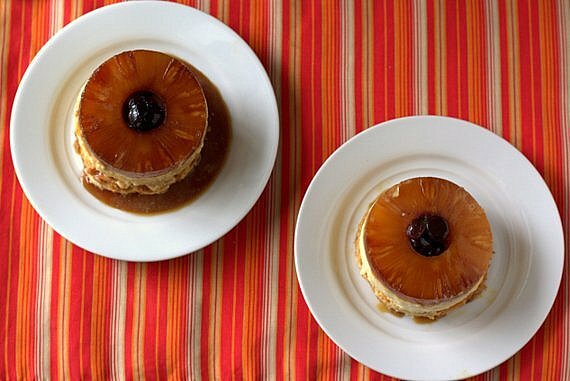 Add a shot of dark rum to your brown sugar topping, and you’re in a tropical paradise. I didn’t use any rum, but if you want to, go for it. I’d say no more than a teaspoon or 1 1/2 teaspoons for each ramekin would do it. 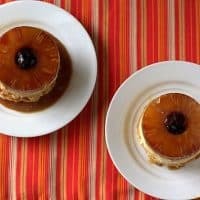 If you’re like me and you love both pineapple upside down cake and cheesecake, combine the two in this very scalable, gluten-free mini pineapple upside down cheesecakes and enjoy! Stir the coconut, sweetened condensed milk, salt and vanilla together until well combined. Whip the egg white to stiff peaks. Take 1/2 and thoroughly fold into the coconut mixture. Use a cutter that is the same size (or a tiny bit smaller than) the opening of your ramekins to make your individual crusts. On a parchment- or Silpat-lined cookie sheet, press about 2 Tablespoons of the macaroon mixture into the cookie cutter. You want a crust that is about 1/4" thick. Remove the cutter and continue making individual crusts. I ended up with five, so one for each of the minis and one for me to enjoy as a cookie. Perfect! Bake at 325F for 18-20 minutes or until lightly golden brown on the tops and deeply golden brown on the bottoms. Let cool on the sheet for five minutes and then remove to racks to cool completely. Mix the brown sugar together with the salt making sure it's evenly distributed. Place 1 1/2 Tablespoons (packed) of the sugar mixture evenly in the bottom of each ramekin. Top that with a maraschino cherry (well-drained) or whatever fruit you're using in the center of each ramekin. Carefully press 2 Tablespoons of crushed pineapple evenly over the sugar and other fruit. Beat the cream cheese on low speed until smooth and creamy, scraping the bowl as necessary. Add the sugar, salt and lemon zest and beat until thoroughly combined and smooth. Again, scrape the bowl as necessary. Mix in the egg on low speed followed by the juices, scraping bowl as necessary to thoroughly and evenly incorporate the juice. Spoon 1/4 of the mixture into each ramekin. Bring about 2 cups of water to a boil. Place the four ramekins in a cake pan or other baking dish large enough to hold them with at least 1/2" between each and between the sides of the pan and the ramekins. Put the pan holding the ramekins on the middle rack of the oven and then carefully pour in the boiling water to a depth of about 1". Bake the cheesecakes for about 40 minutes or until the internal temperature of the cheesecake is 155F. (Check at about 30 minutes and go from there). Remove each ramekin from the pan of water and let cool on a rack for 30 minutes. Leave the pan of water in the oven so you're not sloshing boiling water all over the place. You can pour out the water once it has cooled off. Run a thin knife around the inside of each ramekin. Place a coconut crust on top of the cheesecake, bottom side up, and place a serving plate on top of the whole thing. Flip everything over and shake a bit to release the cake onto the plate. Oh, I should note: I used pineapple rings for the photos, but I don’t suggest you do the same just for eating. It’s almost impossible to cut through the rings without smooshing the cheesecake. While it looks nice for photos, I don’t recommend it for actual execution. If you still want the ring look without all the horror, you could cut each ring into segments and piece them back together in the ramekins. It would make it easier to cut. Just an idea. Thanks for spending some time with me on Inaugural Cheesecake Day! Have a lovely day, and do make some cheesecake. OML Jennie, you’ve done it again. 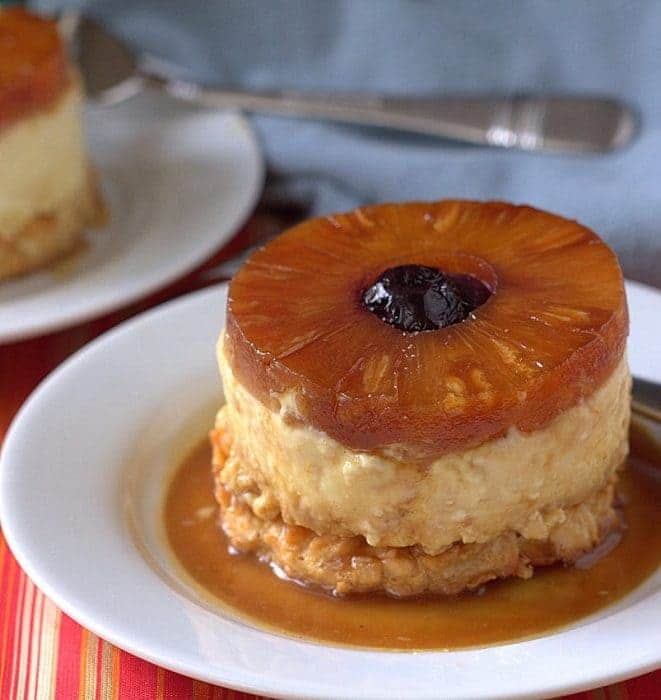 This looks fabulous and the recipe is making my tastebuds do the tropical hula. Going to have to try it. Thanks for sharing! I am pretty sure a serrated knife applied to the pineapple would cut through ok.
they look fantastic with the slice on top!! This is simply stunning, my friend! Beautiful and all elegant! Not our mom’s anything! 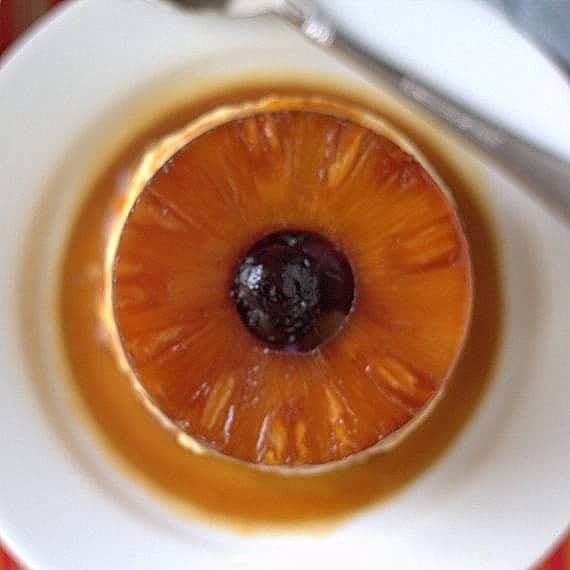 I love how you made it individual which is so much nicer to serve but really isn’t it just perfect with the pineapple rounds? Kudos to you, you talented pastry chef, you. I must admit, I was sucked in by how cute the rings on top are, but they’re hard to cut. A dilemma! But so good–yum!